Beautyberry is a deciduous shrub found naturally in the southeastern United States. It typically grows 4 to 5 feet tall and wide, although it's been known to reach 9 feet in height. 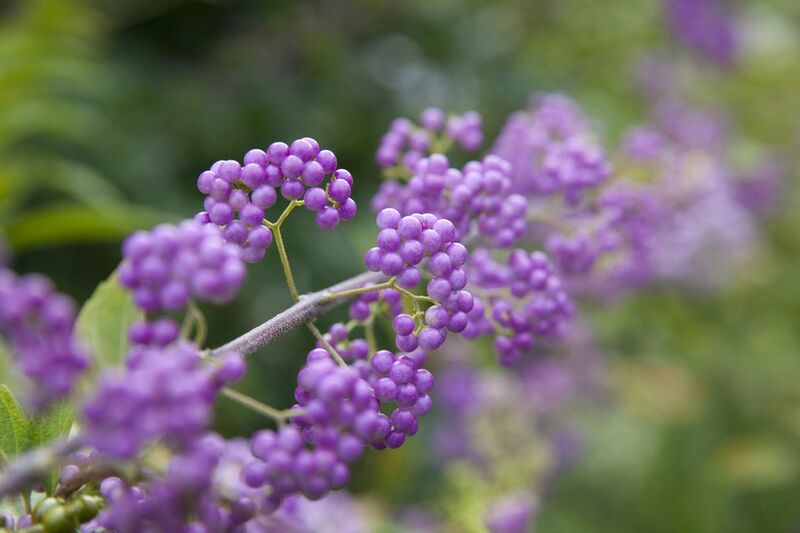 While beautyberry's foliage is unspectacular, this plant is known for one remarkable feature: bright purple berries that grow around the plant's stems in plump clusters. Due to their remarkable berry display, beautyberry shrubs are striking enough to be used individually as specimen plants. You can grow several of them in a border; the more the merrier. Multiple plantings also ensure better berry production. The outstanding characteristic of beautyberry shrubs is, no doubt, their berries. Not only are the berries a beautiful light purple color, but they also persist into winter, affording winter interest to human eyes starved for color in snowy regions. The purple berries remain attractive into early winter but may show signs of shriveling and discoloration by mid-winter. By late winter the berries may attract hungry wild birds. The wild birds will benefit from Callicarpa berries, too. Birds treat these berries as they do bittersweet berries—as an emergency food source, to be eaten after all their preferred berry sources have been exhausted. Bees and butterflies are attracted to the flowers of C. dichotoma. The foliage is a favorite of the white-tailed deer. The arching branches bear pinkish to light purple flowers in summer, which mature into their signature light purple berries in autumn. The fall foliage of Callicarpa is yellow. In colder climates, a frost can cause leaf color to pass from green to brownish, skipping the intermediate yellow altogether. As long as they remain on the branches, the brownish leaves greatly detract from the display of the berries, the more mature of which are not damaged by frost. Beautyberry shrubs are very resistant to diseases and pests, making them a particularly easy shrub to grow. The berries are non-toxic but don't have a particularly pleasant taste. Beautyberry shrubs should perform well for you whether in full sun or partial shade. These plants are not particularly fussy about growing conditions. Either clayey or friable soil is fine for beautyberry shrubs. These naturally grow at the edge of swampland or in moist thickets, so a moist soil is preferable. The more sun these plants receive, the more water they will need. An inch per week is ideal, but they can survive in drier conditions. If they are in a sunny spot or it's a particularly dry period, a slow deep watering will be beneficial for the beautyberry shrub. Beautyberry shrubs don't have any particular temperature requirements, beyond thriving in their hardiness zones. They do not need fertilizer. The shrubs will benefit from a shovelful (or two) of compost in the spring. Too much fertilizer will result in fewer berries, so resist the urge to fertilize these plants. The beautyberry shrub will reseed itself. You can collect the seeds to grow the shrubs. Gather seeds from very ripe berries and grow them in individual containers. Keep the containers indoors and protected during the first year. Plant them outside the following winter. American Beautyberry: Callicarpa americana is native to the southeastern United States. It can grow wild. There are varieties with purple or white berries. Asian Beautyberry: Japanese beautyberry (Callicarpa japonica) and Chinese beautyberry (C. dichotoma and C. bodinieri) are a little more cold tolerant and generally smaler than the American types. The berries tend to be smaller as well. Berries can also be white or purple. These species can become invasive. Since beautyberry shrubs bloom on new wood, they are generally pruned (for shaping, if desired) in late winter. At the northern end of their range (zone 5), they are often treated as herbaceous perennials, by pruning them down to within 1 foot of the ground each year just before spring. Beautyberry is often confused with "beautybush," or "beauty bush," (Kolkwitzia amabilis), a member of the honeysuckle family. The two plants are unrelated and are similar in name only.